From the time we are very young we are taught to never touch a young bird, or to go near a nest for fear the parents will abandon it. On the whole, this has done the birds a lot of good. 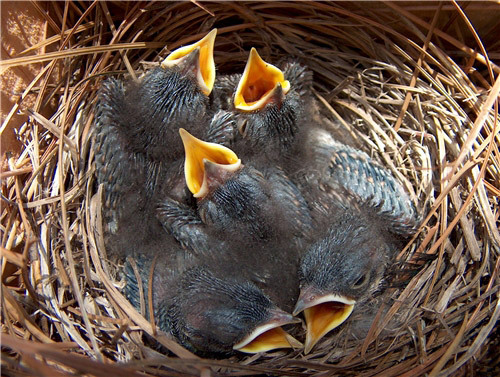 In truth, a parent bird’s instinct to protect its young far outweighs its fear of people. Opening a nest box to check its contents can be a great benefit to bluebirds and is a matchless opportunity to learn about their nest biology. A bluebird house put up and never monitored is like a letter never sent. At, best, bluebirds may get a brood out of it before a house wren or house sparrow takes over and fills it with nesting material, barring any other species. At worst, it may fledge broods of house sparrows, which oust and kill bluebirds wherever they find them. Proper mounting is vital to safe box monitoring. Repeated visits to a box lay a scent trail that invites predators like raccoons to check your box for you, with disastrous results. A box mounted on a metal pipe that’s fitted with a predator baffle can be monitored without fear of a tragedy. 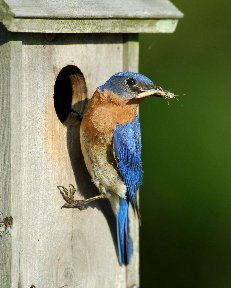 Properly mounting your bluebird boxes on metal poles fitted with 24″ stove pipe or 30″ conical metal baffles will prevent depredations by climbing predators. Situating boxes 100 feet or more from shrubs or trees will make them less attractive to house wrens. Day 1: Bright coral pink skin, eyes sealed, down in sparse tufts. Day 7: First feathers burst from tip of sheaths. Eyes open as slots. Brooding by female stops. Day 13: Cut-off date for box checks. Fully feathered young become increasingly active, and may fledge prematurely if box is opened. Day 14-22: Fledging and first flight. Empty the soiled and flattened nest. Young remain in cover while parents bring food. Day 28 on: Fledglings fly strongly, following parents who fed them. Nest: Note inches of material, whether cup is lined, condition after fledging. Many trail operators keep a spiral bound notebook with a page for each box. Refer to the last entry before approaching the box.